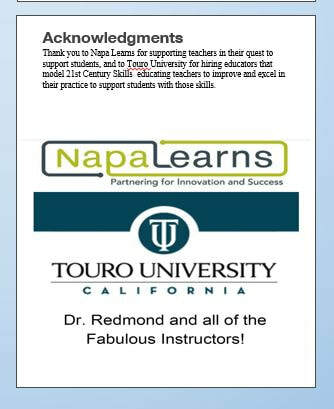 I am very grateful to the excellent staff and support from Touro University throughout the course and to Napa Learns for tuition support! I appreciated the quality of the curriculum and the ability to meet in the Zoom room, which is a fabulous technology for online learning for busy educators. My goal for next year is to bring more Visuals, via technology, to each unit in the Pre Calculus courses that I teach, while encouraging a growth mindset approach for all students with focused lessons, and continual support around growth mindset. I plan to continue to develop more tech tools for my students and colleagues, and also, to assign students to use the tools to enhance their learning in this 21st century. I will also keep looking to new technologies to bring in to my practice. I will continue to use student surveys and looking at data, to inform my instruction on a regular basis. My research questions will continue to be around tech tools for me and my students. To learn more, please access the Napa Learns and Touro webpages via the links below.